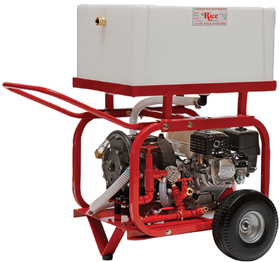 The DPH-3B, a triple diaphragm pump, recognized as the most versatile sought after hydrostatic test pump on the market. Exceptionally smooth and quiet operation in comparison to the twin diaphragm, the triple diaphragm requires no pressure accumulator. EXCLUSIVE, to the RICE Hydro triple diaphragm pump is the “DURAphragm technology”, where pressure is spread across the entire face of the diaphragm virtually eliminating torn, damaged diaphragms. Another design upgrade is the inlet suction diaphragm assembly, eliminating the concern for ruptured diaphragms caused by pressure feeding, is now a separate assembly from the pump, which can be added at any time. The diaphragm design allows for the handling of up to a 10% chlorine solution, and the ability to be run dry without damaging the pump. 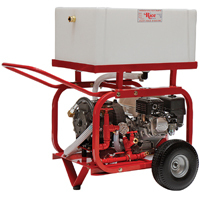 A large volume, medium pressure test pump, this unit is recommended for testing up to 24” diameter lines. Outlet: 1/2” with Quick Connect Couplings. High pressure 8ft. hose. Pressure regulator adjusting to 550 PSI. Pump: Triple Diaphragm, inner oil bath protection, innovative “DURAphragm technology”, and helical gear reduction.